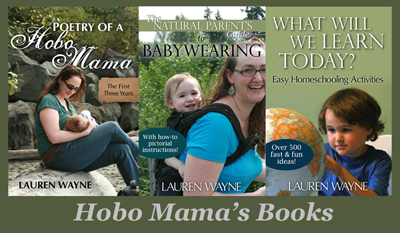 Here are some books we've been enjoying lately. Whenever we go to the library, Mikko races around the children's section, stealing down all the books the librarians have set up for display. I figure that's what they're there for, though, right? And the librarians have excellent taste. Some of the following are from that source, some were Christmas gifts, and some were much more randomly chosen by Mikko. 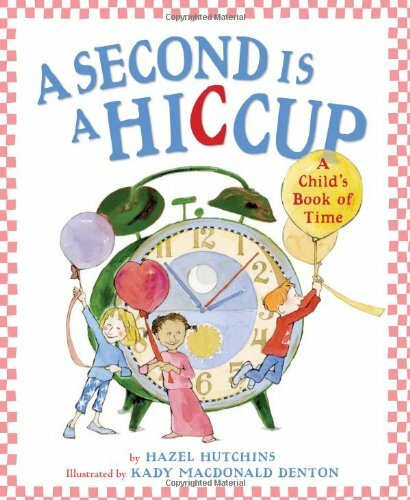 This is a children's book to explain time, and it's brilliant. As you can tell from the title, it starts with the analogy that a second lasts as long as a hiccup, and it goes from there, in lyrical verse, from minutes to hours to days, all the way up through years turning. Here's a fun snowy storybook, perfect for much younger kids, too, since the text is so spare. Cat and dog and pig and duck take a ride in Mr. Horse's sleigh. It starts off as an entirely predictable — if admirably polite and readable — winter tale and then takes a gleeful turn that had all of us (Mikko, Sam, and me) giggling. I don't want to spoil the surprise, so go pick it up! Nicola Smee has others in the same farmyard animal series, so I'm going to see if I can track down some of the others: Clip-Clop and Splish-Splash. This is one of those instances where Mikko's more advanced than I give him credit for. I looked at the relatively dense pages of text in this book and thought, He'll never sit still for a long nonfiction book like this. But, whaddya know, he did. To the point that if I try to skip anything to make bedtime go faster, he totally catches me at it and insists I read the whole thing! This is also a good example of how I want to expand my own horizons when it comes to unschooling. 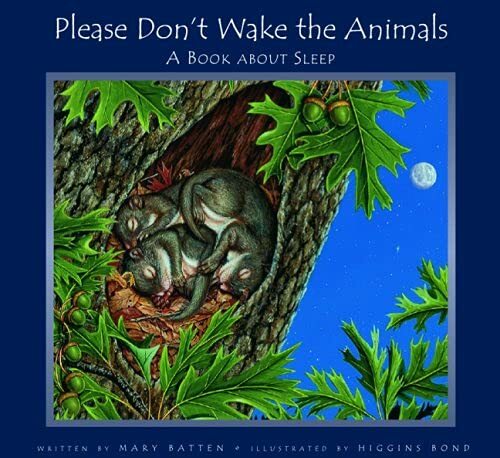 This is what could be classified as a science book, since it's a nonfiction book (and an accurate one as far as I know) about the sleep habits of different mammals, birds, and insects. It's not the type of book I'd necessarily have picked up on my own, so thank goodness Mikko was attracted to it. I'd love to "strew" books for a wide variety of subjects. In some ways, this type of thing makes me fearful of unschooling — what if I'm unqualified as a non-science-y person? — and in other ways it reassures me, because Mikko came to this book, anyway, without any help of mine. But to the book! Even though it has a lot of information, so would be great for elementary children as well, it has one main phrase per page that's pulled out in larger font, plus nicely detailed, almost photographic, illustrations, so it could easily be shortened up for kids with smaller attention spans. I found out the answers to a lot of interesting things I had wondered — like, that horses can lie down but usually sleep standing up, in snatches throughout the day — and ones that I had never thought to wonder — like that three-toed sloths sleep hanging by their claws from tree branches. This is a great book to end a bedtime reading on, because the long text is dispassionate and soothing, and it shows page after page of sleeping animals, ending with little kids falling asleep. I also appreciate, for diversity reasons, that the humans shown are realistically drawn girls of color. Another aspect of diversity is that the featured animals are from locations worldwide. Hilarious! This book magically brings young readers into the story by asking them to interact with the book. 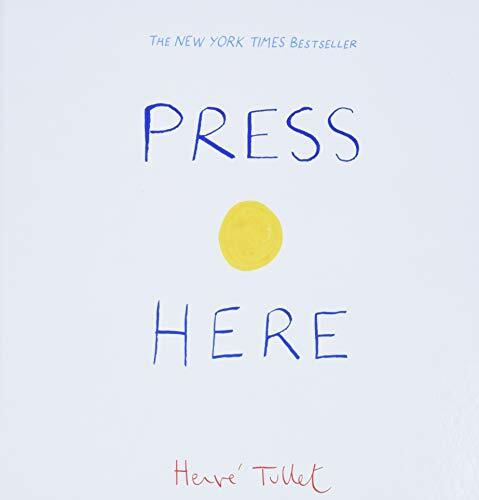 The yellow dot that starts out becomes more than one dot from being pressed, then the dots change colors by being rubbed, then move around the page from being shaken, then tilt from one side and back from the book being tipped to the left and right, flash on and off like lights from being pushed hard, and finally grow ever bigger to the sound of the child's clapping. Mikko gets a kick out of watching the dots progress as (apparently) a direct result of his actions. Even though he's old enough to get the joke — heck, even though I'm old enough — the book invites a willing suspension of disbelief as you turn each page to see if what you did worked. My one recommendation? Do not read this book just before you want your kid to fall asleep! It winds up rather than down. 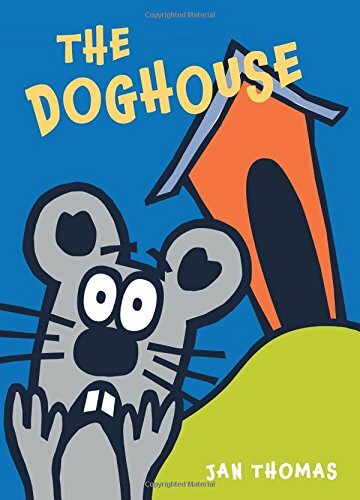 Someone recommended this book to me in my comments at one point when I was talking about Mikko's picky eating, and I can't remember who or find where it was. (If it's you, let me know!) Anyway, I finally got a chance to check this book out of the library, and we love it! It's probably Mikko's favorite book right now. It's another long-ish one, making Sam groan whenever it makes its appearance as the fifth bedtime story request (heh), but I think it's great that Mikko's sitting through longer and longer books. It's written in well-paced verse with some interesting rhymes and tells the story of Mrs. Peters and the seven children who come along in succession, each of whom will eat one thing and one thing only — but each a different thing. Poor Mrs. Peters is run ragged trying to make them all their favorite foods, until they take a turn cooking for her at the end. I doubt highly that Mikko gets the "point" of being less picky himself; he thinks the children are silly for eating what they do, but he'll tell me, for instance with regards to Mac's choice of oatmeal, "Yuck! I wouldn't eat that!" Ah, yes, clearly the moral is sinking in. What Mikko does like, though, is what fascinates me as well: a family of seven children! A beautiful, lively, vibrant bunch, as seen through the gorgeous illustrations. Each one grows in turn as Mrs. Peters carries the next, and the next. It's not fully an AP or natural book, perhaps (Peter, the firstborn, is being fed bottled milk — although it's glass bottles — and the next-born, Lucy, drinks only pink lemonade, which makes you wonder how she's grown up at all), but it has that vibe if you look beyond the preposterousness. She cloth diapers and cooks from scratch, for instance. (My inner editor would also have me state that the plural of Peters is Peterses, not Peters. I wanted that on the record, even though it doesn't fit the rhyme scheme.) The Peterses all live at what looks like a vacation cottage at the lake but that has been adapted for year-round use. It almost gives the impression that they didn't mean to have so many kids, because in the scene where the children plan to make their mother's birthday surprise, all seven are sleeping in the same cramped room. For whatever reason, this made me smile, seeing a jumble of bunkbeds, different styles of beds, and a couple cribs for the youngest twins. (It also made me grin to hear Mikko ask, "What are those cage beds?" of the cribs.) I also love the details, like Mrs. Peters occasionally having a spare moment to pick up her cello during her childrearing, or the scene where the littles clearly are suffering through a cold, or spotting one of the kids in the background on the toilet. There's so much to look at on each page that I enjoy how long it is! I also wonder at the end how good that recipe would be! Has anyone tried it? What's on your bookshelf right now? I love reading suggestions! These all look great! 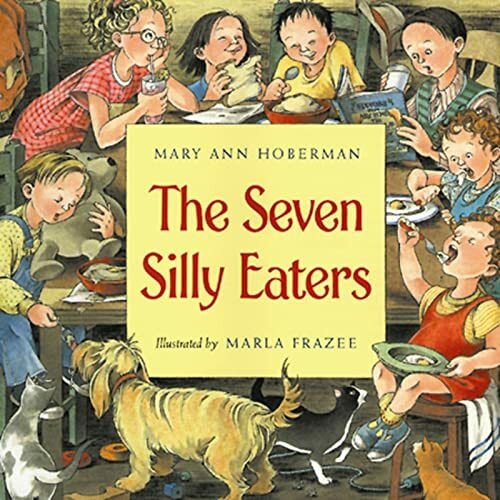 The Seven Silly Eaters was my suggestion - I thought you would love it! Andrew groans at requests for it due to the length as well, but I could read it all day long and love the very details you mention. I like that they grow their own apples, too. I'm not sure that recipe would turn out very well (especially given that the apples appear to be whole when added to the batter! ), but it's fun to think about all the same. Great list! And we, too, adore the PetersES and their highjinks. (I've had this book on my To Do list for a review for a while. I like how the illustrations include the pregnant mom casually, w/out it being all about having babies). My daughter actually requested "a pink and plump and perfect cake" for her 3rd birthday and we did our darndest to make one. If you google for it you might find the same recipe we tried (a fan created recipe). Sadly, the bundt/fiestaware pan we used had very detailed sides and the cake ended-up as un-plump as you can possibly imagine, and because we used cherry juice instead of the artificial coloring it wasn't pink (at all) but we colored the icing and Uli seemed quite pleased with it nontheless. and Alice in Wonderland (the boys think it is hilarious!). Clip Clop is just as good as Jingle Jingle, I haven't read Splash Splash though. I'm going to have to look for that book about time at our library. That's what our coop is focusing on next month, and I'd love some help explaining the idea to a group of kids too young to read a clock. Moira is into the beginning chapter books, so we have been reading a lot of Amelia Bedelia and Henry and Mudge. She also seems to have fallen in love with one of the board books Davis got for Christmas. "Mikko races around the children's section, stealing down all the books the librarians have set up for display. I figure that's what they're there for, though, right?" Yes, that is what the books are there for! Thanks to Mikko, for appreciating the work of his librarians! Lovely books,I will look up Please Don't Wake up the Animals.Sounds interesting and smth my DD would enjoy. As for H.Tullet,he is a genius. Haven't read this one yet,but we love him a lot.Here is my post about his other books. Press Here reminds me of The Monster at the End of this Book-- have you read that one with Mikko yet? It's one of my favorites. I am going to have to hit Amazon when we get our tax money back and buy some of these and some other new books. 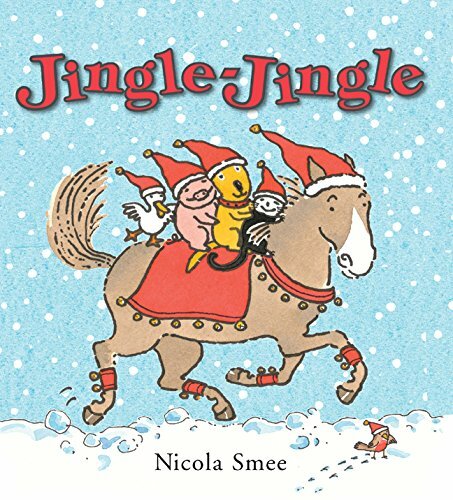 We love reading and I bet Suzi would love Jingle-Jingle and Seven Silly Eaters!